I was taught to coax that small ball of mud into the first shape; the dog dish. The flower pot and mug followed. 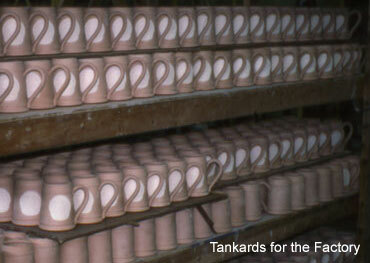 I shaped hundreds of thousands of those mugs for the factory. 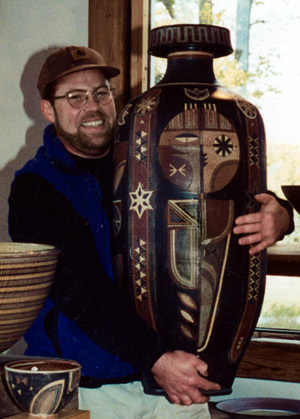 I've traveled the Midwest United States, working for, and learning from, the older regional Studio Art Potters. Beautiful, curvy, lady vases. Some with big heads. Dark angels and black Marys. Swimsuit models. Navigational aids. Bowls, Bowls. Bowls. Big bottles, and little bottles, and all the bottles in between. More mugs. Plates and platters. Vases and jars, and even more mugs. I work mostly on my own pots now. I throw crisp, traditional, functional forms. My decoration is applied when the pots are leather hard, by hand carving lines and textures, and painting with slip clay, tinted with metal oxides. The pots are bisque fired, glazed, and fired a second time to stoneware temperature. I enjoy the message of the decoration most. On a small cup or bowl, the message must be short and to the point. A simple band, or some little squares. A large vase might require the story of creation. With a strong math background, many of my decorations tend to be very geometric. I feel the human image to be the most interesting and satisfying to use as the basis for my compositions. These images help to continue to ask, "who are we?" University of Alaska, Fairbanks, Ak. University of Northern Iowa, Cedar Falls, Ia. 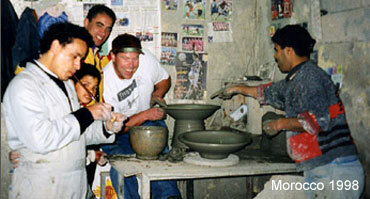 Contract Studio Potter - Midwest U.S.
Clay Bay Pottery, Ellison Bay, Wi. What Cheer Potters, Kate & Jerry Huffman, What Cheer, Ia. Mary Deneen/Martha Winter Studios, St. Paul, Mn. Production Potter, Cloth & Clay Inc., St. Paul, Mn. Thrower for Hire, Dean Schwarz Pottery, Decorah, Ia. Production Potter, Red Wing Pottery, Red Wing, Mn. 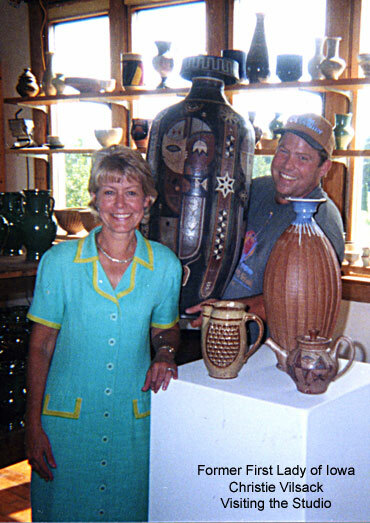 General Manager, Heritage Designs Pottery Hayward, Mn. Production Potter, Heritage Designs Pottery, Hayward, Mn. Production Potter, Deneen - Coiner Pottery, St. Paul, Mn. Mold Maker, Deneen - Coiner Pottery, St. Paul, Mn. Community of Artists, South Bear School, Decorah, Ia. Volunteer Laborer, Dean Schwarz Pottery, Decorah, Ia. Lab Assistant, Luther College Ceramics Dept., Decorah, Ia. Continental Clay Co., Minneapolis, Mn. University of Iowa, Museum of Art, Iowa City, Ia. Terrace Hill, Iowa Governor's Residence, Des Moines, Ia. University of Alaska-Fairbanks, Fairbanks, Ak. University of Wisconsin-Stevens Point, Stevens Point, Wi. South Bear School, Decorah, Ia. Laumeier Sculpture Park Gallery, group, St. Louis, Mo. Plaza Art Fair, Kansas City, Ks. Cambridge Pottery Festival, Cambridge, Wi. Art Fair on the Square, Madison, Wi. 2006 Evergreen Festival of Art, Evergreen, Co.
2006 Bayfield Festival of Art, Bayfield, Wi. 2005 Bayfield Festival of Art, Bayfield, Wi. 2005 Cresco Art Festival, Cresco, Ia. 2004 Marion Art Festival, Marion, Ia. 2000 Edina Art Fair, Edina, Mn. 2003 Art Splash, Sioux City, Ia. 2001 Artigras, Green Bay, Wi. 1999 Laumeier Contemporary Art Fair, St. Louis, Mo. 1999 Edina Art Fair, Edina, Mn. 1998 Edina Art Fair, Edina, Mn. 1998 Laumeier Contemporary Art Fair, St. Louis, Mo.